On December 21, 2009, our second son decided to come into the world with the assistance of our mid-wife Esther and our doula Michelle. We were so full of the bliss that comes with bringing another sweet baby into the world naturally and the wonderful breastfeeding experience that was to follow. As we were leaving the hospital, we were given a “breastfeeding support” bag from Similac and other formula companies. You know the ones. In all, we were given five full-sized cans of formula in a bag with a tag on it that read, “For breastfeeding moms.” Not one thing in there even mentioned the word “breastfeeding.” Hmmmm… I thought as I politely declined the bag. In the weeks after Owen’s birth, my husband and I began a discussion about this. We hypothetically talked about what would be in a real breastfeeding support bag- what were the products and bits of information that made breastfeeding better for us? My husband, the ever supportive rock that he is, knew that this discussion, coupled with a type-A, freakishly organized woman such as myself, would lead to something…and it quickly did. I e-mailed every company that I believed in, had heard good things about, had personal experiences with or my friends had, and asked for their help. Within days, I had teamed up with over 40 companies and organizations who were nothing short of thrilled to help. Donations of information and samples flooded my front porch and my guest bedroom. 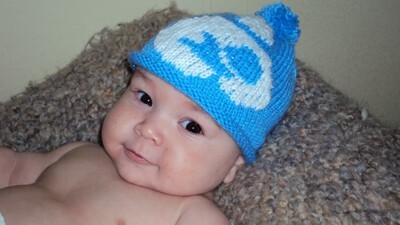 And so, like Owen, the Laramie Breastfeeding Bag Project was born naturally and out of great determination. After putting together sample bags, I called our local hospital and spoke with the the lactation coordinator. She was very receptive to the idea of true breastfeeding support bags. We met and she approved the bags with flying colors. As of March 2010, women who give birth at Ivison Memorial Hospital are given the bags from the Laramie Breastfeeding Bag Project. We are now approaching almost 125 bags filled. Currently, there about about 30-40 births per month at our hospital. We continue to get more donors, both at the local level and at the national level. This includes the hospital, who worked along with midwife Esther Gillman-Kehrer to donate reusable bags. They purchased 400 more reusable bags to keep the project going. The bags say, “Breastfeeding is (Eco)logical.” This means that we now have the donations and supplies to continue the project for at least another year, and hopefully indefinitely! 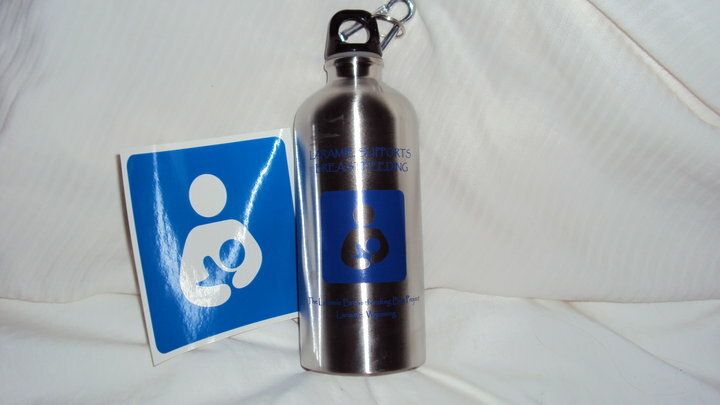 The Laramie Breastfeeding Bag Project has also purchased stainless steel (BPA free) water bottles that say, “Laramie Supports Breastfeeding” and features the International Breastfeeding Symbol on it. ALL money raised goes toward the purchase of more stainless steel water bottles to include in the breastfeeding bags. Because of the success of a recent fundraiser, the Laramie Breastfeeding Bag Project was also able to purchase additional items to add to the bags so that new breastfeeding moms get even more goodies. The Laramie Breastfeeding Bag Project was also able to purchase International Breastfeeding Symbol stickers. Local organizations and businesses are being given these stickers to display in their windows as a statement of support for breastfeeding moms/customers. This project has just started. Along with the stickers, the businesses and organizations are being given information about breastfeeding laws in Wyoming, ways to support breastfeeding customers, and how breastfeeding impacts the entire community. Our local hospital, Ivinson Memorial Hospital has also initiated the Laramie Breastfeeding Coalition as a result of the momentum. This group meets once a month and includes representatives from Ivinson Memorial Hospital, WIC, Public Health, area midwives, local nurses, La Leche League, area doctors, a clinical nutritionist, myself, and others. The group encourages interested healthcare professionals and others to join in order to promote breastfeeding city-wide. The group will also be working with the Laramie Breastfeeding Bag Project to promote the stickers in local organizations and businesses. Ivinson Memorial Hospital now proudly displays their international breastfeeding symbol stickers in all entries and on each floor and is making steps toward becoming a certified “baby-friendly” hospital. If you are interested in starting something like this in your town and don’t know how to begin or you have questions, please feel free to contact me and I would love to help you take the steps to get started. Amandamack5@yahoo.com or join us on Facebook- Laramie Breastfeeding Bag Project. Happy nursing! A Mother’s Boutique is a proud sponsor/donator to the Laramie Breastfeeding Bag Project. I met Amanda through Sarah Pruis of One Creative Mama and am so glad that I did! I am truly honored to be a part of this project! If you have a similar project in your town, or want to set one up, please leave a comment below. 43 comments to Breastfeeding Bags At Hospitals – A Remarkable Project! It is important to mention the dangers of pregnant women drinking from plastic bottled water which may leach harsh chemicals. Nice to see a Stainless Steel Bottle included in the bag. Awesome, awesome work! I absolutely love how this project came together. Would love to do something similar for my local hospital, but we probably have 30 or 40 births a DAY there. AWESOME! I hope this spread to EVERY hospital/birthing center!! This is truly amazing!!! I LOVE to read stories like this..babysteps CAN and DO make a big difference!! this is fantastic! I’ve often wondered why hospitals give out formula instead of manual breast pumps or other breastfeeding friendly items. SO, SO, SO awesome. Congrats! I’d love to see something like this get started in Tulsa, OK where I live. What a amazing idea! You truly are helping so many people!!! It excites me that something like this was started. I only wish that we could make it world-wide!! I am interested in starting something similar here in my small city in Saskatchewan. Is there any information or help you can give me? It would be much appreciated! This is so amazingly cool!! I knew I didn’t want the formula in our bag, but I wanted the free bag…hey, one less thing to shell out $$ for. I ended up donating the formula to a family who uses formula and really needed more. I would love to start something like that but I feel really overwhelmed by the idea. I cannot believe you did this!!! Just seems so huge and insurmountable to me. And I love love love Owen’s hat!! Actually, I love the whole bag! Makes me want to fly to Laramie for our next baby, lol. I just wanted to say KUDOS to you. It has bothered me so much that my “breastfeeding information” is sponsored by Similac. So wrong. I’ve shared this blog with my moms’ group. This is great! I also got the bag full of formula & coupons forced on my by the nurse who said I would need it. I donated all the formula & coupons to a women’s shelter. What is so discouraging for me is that formula companies have the money to do this. They make such a huge profit and turn that into “free” product to get moms hooked on their brands from the first hours of baby’s life. Breastfeeding isn’t lucrative, so getting the support is so hard. I wish I could get a program like this going here in San Diego, but we have 3 hospitals very closeby and they deliver hundeds of babies a day! You are an inspiration! This is such a fantastic idea! I’d love to try & initiate something similar were I live. I would appreciate any info or help that you might be able to give me. KUDOS! This is awesome. My 1st child is 5 months old & I have said repeatedly that I can understand how people with no support system & resources easily give up on breastfeeding. We overcame many obsticles to be a breastmilk only baby. (He did have formula that 1st week a few times, much to my dismay). I also got a bag, not from a formula co, but from the hospital itself & since I was breastfeeding it was practically empty. I am now a stay at home mom & would love to help our local LLL do a project like this. I am forwarding this to them right now. We give out Boobies for Babies kits. We get request from all over the country and our local OBGYNs and hospital took them! I would love to initiate this in my city! I had a home birth and the formula companies still found me, and sent cans of it to me in the mail! Argh! 11 mos BF and going strong. This is AWESOME! You are to be commended for doing this! I hope to find this soon in every hospital! If I can find the space in my house, I would love to do this as well. I love how you have taken it out to the community as well. Makes me want to visit Laramie. Your local (or state) tourism bureau should know about this and play it up. Are there rankings for breastfeeding friendly communities? I know the CDC has report cards for states…but they should rank communities. thank you for sharing judy! i will definitely email amanda.. we are hoping to establish a similar project locally. I think so many commenters summed this up perfectly ‘AWESOME’! I was thinking about trying something like this with my doula clients but was not sure where to even start. I would love the info to get the ball rolling. Okay so first of all how did you get started asking for donors? I’d love to work with your foundation to get these bags in my local hospitals. This is such a great idea, and I wish it was in my hospital where I gave birth. I too got the traditional “breastfeeding” bag. Which sadly sat in the back of my closet for the longest time. I thought well, that’s a nice bag and I’m sure we’ll be able to use it. I took the “helpful information” (not) out of the bag and ended up giving it to a friend who in turn breastfed. She was in need of a bag, for her pump and supplies going back to work, and it worked perfectly. Please let me know if there is any way I can help out the foundation to get it in the local hospitals around me. I live in Nebraska, and would even love to know how to get a program like this started here! I love this project. I would like to donate about 30 pairs of reusable nursing pads. I am a L&D nurse and also teach natural childbirth classes out of my home. I have two boys that I birthed naturally and nursed both over a year. I would love to kick those black bags from the formula companies to the curb in my hospital and also the other local hospital in our town. Would love to get some start up ideas on how to get a program going like this in my town. I am positive I would get great support from many in my hospital (from midwives to ob/gyns to pedi’s and nurses) Please let me know your thoughts! Thanks for such a fantastic idea!! This is such a wonderful idea!! I live in the Orlando area and we have quite a few busy hospitals that could definitely use these. I’d love more information on how to set this up, how to get the ball rolling, types of samples/coupons you’ve put in, etc… Would you mind sending me some info? This is so awesome…what sorts of samples are in there? Nursing pads, maybe? I have already contacted some of my fellow lactivists in my area and we want to try and get the ball rolling here in NE Arkansas! Awesome project!! I’m pregnant with my first due at the end of August. I would LOVE one of these bags. I’m delivering at a Birth Center versus a hospital. 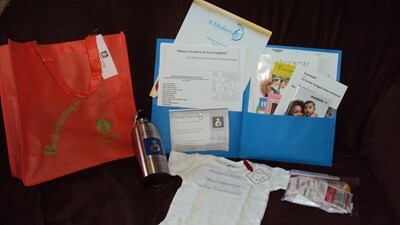 I would think the Birth Center would give out this kind of stuff but they don’t since they are a non-profit. I really can’t wait to start this nursing journal but finding the support seemed to be so hard at first. This project sounds like the support some women need. Great work and I would be happy to help in anyway possible. Hello! Thank you all so much for your great feedback! Many of you mentioned that you were interested in starting like this in your area and I assure you, it is entirely possible! (I started in with newborn and my friend in mama to three kiddos- all possible and it sure makes motherhood even more fulfilling when you are doing something that is so important to you! Feeds the soul, I guess!) 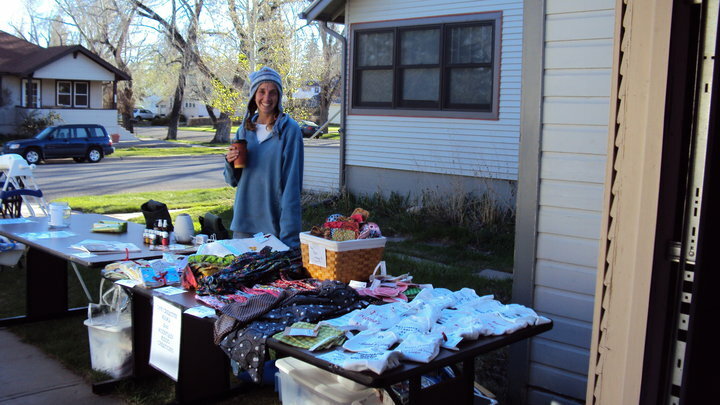 I have prepared a document on the steps that I took to get started and it is on our Facebook page- Laramie Breastfeeding Bag Project, under the “discussions” tab. Please feel free to e-mail me: amandamack5@yahoo.com. I typicall am really prompt with e-mail, but I am visiting my parents in Michigan right now and working the dial-up connection so I might not be as prompt as I would like to be. Thank you again for your support!!! So excellent! All it takes is one person’s creative idea and some motivation and presto – success! Bravo!! Hello! I found this link through a new friend on facebook. My name is Amanda Mack, and she thought I was you! While I can’t claim this awesome idea as my own, I am a birth doula and hope you don’t mind if I try something similar in the future. I’ll also be joining your FB page to learn more about this wonderful project. I am from Singapore. Would like to start something similar. Can u email me? I had my 2nd child a couple weeks ago at Mercy hospital in Buffalo, NY and was happy to find they no longer offer the formula company diaper bags to breast feeding moms. I guess its part of a new program started by gov. Patterson to encourage breastfeeding as a way to cut state Medicaid and WIC funding. So now if a mother says they will be nursing the hospitals don’t offer them formula. Seems like a common sense way to save tax payers money both now and in the future. I must admit I was a little disappointed because I really needed new diaper bag so I told them I was considering supplementing just to score new bag! Jocelyn- Please join us on our Facebook page-Laramie Breastfeeding Bag Project for more information on starting a project like this in your area. Please let me know if you have any questions. Thanks! This is a super idea. I am a CLC and run a breastfeeding support group. We have decided to try something like this for our own city (breastfeeding bags for hospital births). Can you share which companies were willing to supply samples, coupons, information? We are pricing some inexpensive cotton bags now that will be imprinted with the international symbol and planning a fund raiser to purchase them. Great idea to provide useful items for breastfeeding moms! But don’t be so hard on Similac – my initial reaction was the same as yours, but then my mom told me to calm down and keep the formula around in case of an emergency. She breastfed 4 kids, but with one of my brothers she got a bad case of mastitis and then broke out in hives after a reaction to the antibiotic. Besides, the bag itself was really handy – I used it to house my double electric pump. Seven months later baby and I are still breastfeeding, so now I’m going to donate the formula.